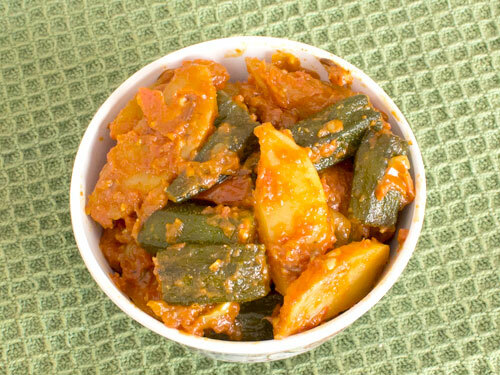 Aloo and bhindi are two basic vegetables in Indian cooking and they make varieties of delicious dishes. Once such simple and easy to make recipe involving both ingredients is mild spicy and healthy shallow-fried aloo bhindi. This Indian curry is suitable for lunch or dinner and has dry to semi gravy texture due to use of crushed tomatoes, curry spices and shallow fried okra and potato slices. Peel and cut potato into two halves. Cut each half into 1/4-inch thick slices. Thoroughly wash bhindi in water and wipe using cloth or kitchen napkin. Put them on a cutting board, remove head and tail parts and cut into approx. 1 inch long pieces. Heat 2-3 tablespoons oil in a pan and shallow fry bhindi pieces over medium flame for approx 5-6 minutes or until they turn dark green and shrink. Turn them with spatula in between to cook and fry evenly. Strain and transfer to a plate. Shallow fry potato slices over medium flame until cooked and crispy or for around 5-7 minutes in same pan. If required, add more oil. Transfer them to a plate. Heat 1 tablespoon oil over medium flame in the same pan. Add cumin seeds in heated oil. When seeds begin to crackle, add finely chopped onion and sauté until light brown. Add grated ginger and crushed garlic, sauté for 30 seconds. Add crushed tomato and cook for 2-3 minutes or until oil starts to separate. Add garam masala powder, red chilli powder, turmeric powder, coriander-cumin powder, sugar and salt, mix well. Add shallow fried bhindi and potato slices, cook for 2-3 minutes. Turn off flame and transfer aloo bhindi to a serving plate. Sprinkle some salt over potato slices while shallow frying to enhance the flavor. You can add more crushed tomatoes to make more gravy. 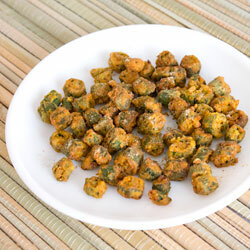 You can avoid tomatoes; simply cut bhindi and potato into small pieces to make it a simple affair. My son is 18, very choosy about food, but he like bhindi & potato in any form, m sure he will like i. Wonderful recipie. Easy to prepare and very tasty too!! but I also want nonveg recipes. I like all the recipes by foodviva. Please add some breakfast recepies also..thanks.. Response: Hi Priyanka, happy to hear that you liked the recipes. Follow the given link view Breakfast Recipes. I like the recipe. We can add some ajwain also. I want for 8 servings, what to do? Response: Hi Bhavna, you can multiply all ingredients by 3 to make this curry for around 8-9 people. It looks so easy and delicious. Surely I will make this for my dinner today! Thanks a lot!